We were delighted to receive this testimonial, and 5 star rating from a company that we helped find invoice finance last year. "Last year when we were looking to change an existing factoring facility, Sean was able to come up with an excellent alternative. He made sure he understood our business needs and was guiding and reassuring during the transition process. We’ve been using the recommended facility for a year now and very happy with all aspects from service to fees. 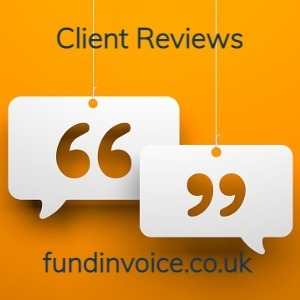 We can recommend Sean and his team to anyone who is looking for invoice finance for their business." Very positive feedback, that was received without prompting. Helping recruiters is a key segment that we are involved with. The number of firms within that sector using invoice finance is significantly higher than the average across all industries. We estimate that use of factoring and invoice discounting is 20 times higher amongst staff agencies, than the UK average usage amongst companies generally. There are plenty of specialist financiers that can help with funding for the recruitment sector, and prepayments tend to be higher than for some other sectors. There are a number of common issues, such as RPO funding, and prime debtor concentration issues, that can be overcome if you know which funders to approach. In addition, some of the specialists that fund the sector offer an array of additional outsourced services, such as credit control and payroll management, that can free you up to concentrate on sales and making placements, rather than handling paperwork involved with running your business. Services such as credit control outsourcing can even be provided on a fully confidential basis, so that all activity is conducted in the name of your company, and using your branding on correspondence. If we can help any other recruiters find funding please don't hesitate to call Sean on 03330 113622 or use the contact form on this page.